As everyone knows by now, USA Today tells us that the "NSA has massive database of Americans' phone calls"
The whole story smacks of a hit piece. It is less a story than an editorial. If you don't believe me read it yourself. Once again, the left wants us to be more afraid of our government than the enemy. The reason, of course, that they're afflicted with Bush Derangement Syndrome, and couldn't care less about winning the War on Terror. The story might not be true. We're supposed to take their word that USA Today checked out their sources, which are conveniently anonymous. Given the record of much of the msm, their word doesn't count for a whole lot. The Bush Administration hasn't denied the story, but that doesn't necessarily mean it's true. Contrary to the way the left wants us to run this war, yes it is a good idea to keep the enemy guessing and no it is not a good idea to announce all of our operations in the newspapers. If true, what the NSA is doing is collecting records regarding calls that were made. The NSA has records of calls, local and long distance, they know who you called. The object is to discover patterns in order to track terrorists. They do not, however, record, the content of those communications. They were not listening in. AT&T, Verizon, and BellSouth have cooperated with the NSA in this venture. Qwest declined, citing legal concerns. For the record I hope the story is true. I certainly hope we're doing stuff like this. Daveed Gartenstein-Ross goes through the basics over at NRO. Two possible laws are at issue, Gartenstein-Ross says, the Foreign Intelligence Surveillance Act (“FISA”) and the Fourth Amendment to the U.S. Constitution. However, the definition of “pen register” in FISA shows that the statute doesn’t regulate the government with respect to the technology at issue here. FISA states that the regulations governing pen registers do not “include any device or process used by a provider or customer of a wire or electronic communication service for billing, or recording as an incident to billing, for communications services provided by such provider.” That is precisely what was alleged in this case: The sources who spoke to USA Today said that the three participating telecommunications companies handed over information that was collected pursuant to their regular billing procedures. FISA does not implicate such action. [W]e doubt that people in general entertain any actual expectation of privacy in the numbers they dial. All telephone users realize that they must “convey” phone numbers to the telephone company, since it is through telephone company switching equipment that their calls are completed. All subscribers realize, moreover, that the phone company has facilities for making permanent records of the numbers they dial, for they see a list of their long-distance (toll) calls on their monthly bills. . . .
[E]ven if [a caller] did harbor some subjective expectation that the phone numbers he dialed would remain private, this expectation is not “one that society is prepared to recognize as ‘reasonable.’” . . . This Court consistently has held that a person has no legitimate expectation of privacy in information he voluntarily turns over to third parties. . . . [W]hen [a caller] used his phone, [he] voluntarily conveyed numerical information to the telephone company and “exposed” that information to its equipment in the ordinary course of business. In so doing, [the caller] assumed the risk that the company would reveal to police the numbers he dialed. So much for the claim that the program is illegal. Turns out that the NSA isn't the only ones gathering detailed information about your personal life. Collecting your names and addresses. Mapping out your telephone numbers and e-mail address. Making note of your interests. Paying close attention to how you spend your money. (Congressmen are) folding these bits of information about you and millions upon millions of your fellow Americans, and—you’d better be sitting down for this part—entering it into searchable databases. Then, worse yet, (Congressmen are) using sophisticated computer programs to develop targeted strategies about how to deal with you in every aspect of your personal life. "Modern American politics", McCarthy points out, "requires a fair amount of data mining." While we're discussing Congress, have you noticed the outrage over how Senator Chuck Schumer's (D-NY) aides gathered private credit information about the GOP candidate for governor in Maryland, Lt. Gov. Michael Steele? About the calls for to investigate Schumer, or for him to resign? Neither had I.
Abraham Lincoln suspended habius corpus during The Civil War. Easy to say now that it wasn't right, but he had a war to fight, one that makes our WOT look like childs play. Are you familiar with FDR's domestic survelience program during World War II? Or that he gave what ammounted to secret orders to the US Navy to fight an undeclared war on German U-Boats well before Pearl Harbor? It's easy to say now that his internment of Japanese-Americans was unjust, but the invaluable Michelle Malkin showed how it was hardly unwise. Lastly, Mark Levin points out that the NSA program isn't nearly as intrusive as ECHELON, which has been in place for years, and no one in Congress complains about it. The bottom line is that that their is nothing illegal or wrong with the alleged NSA data mining operation. Small town elections have a flavor all their own. If you're used to following state and national, you're familiar with their contentious issues and massive media coverage. Candidates are full-time politicians, and have campaign managers and political analyists at their side. Every issue is polled and put before a focus group. Then there are local elections. Throw out everything you read above. In small towns and jurisdictions, the elected positions are part-time, and it's usually just the candidate and a few close friends. There are few big or controversial issues, and absolutely no polling. 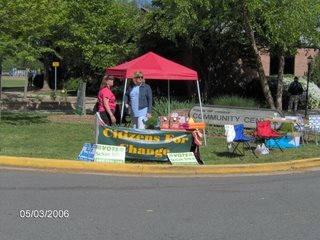 On Tuesday May 2 towns and cities across Virginia held elections. One of them was Vienna, Virginia, the town where I grew up. 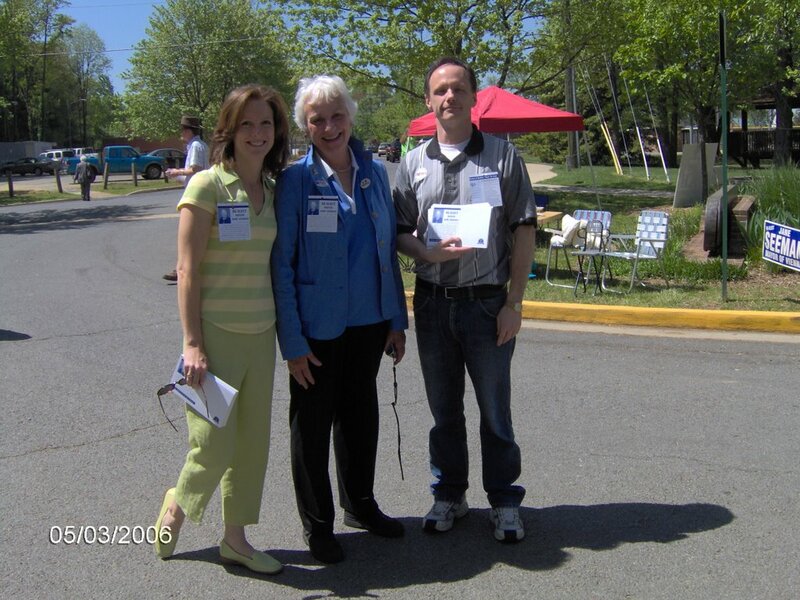 It holds special interest to me because my mom is the mayor, and she was up for re-election. Is is cool or what to have your mom as the mayor? I think it is. Vienna is a town of just under 15,000 people, and is about 15 or so miles west of Washington DC. It is almost entirely residential, with some strip mall-type stores downdown along it's main street. It is located in Fairfax County, which is one of the wealthiest in the nation. The residents of Vienna, like most everyone else in northern Virgina, pretty well off economically. The town council consists of 6 people, who serve a 2-year term. Every year 3 seats are up for election. The mayor serves a two year term, so every other year the mayor and three council seats are up for election. Most of the time the council seats are contested. Rarely is the mayorial race contested. This time my mom faced a challenger, one of the council members whose seat was not up for election this time. All three town coucil members were running for re-election, and there were two challengers. Generally speaking, in small town elections issues do not matter. There are exceptions, of course. In Herndon VA, not too far from Vienna, politicians who supported a "day laborer" (read "illegal alien) center were thrown out. There are also situations in growing communities whereby the construction of a new school raises controversy. But generally there are no overriding issues because small towns do not control schools and do not discuss issues like abortion, gun control, or the war in Iraq. The situation changes when you get to cities and counties, but again, this post is about small towns. Getting elected in a small town is all about knowing a lot of people. It's about being involved in the community for years, preferably decades. It's all about participating in everything from the Boy or Girl Scouts to Little League Baseball to serving on the town planning commission or board of zoning appeals. In short, people vote for people they trust. And they trust people they either know or see who have been involved in their community. The reason for this is simple; most people don't pay attention to what goes on at town hall. As long as the trash gets picked up and roads are repaired, and taxes don't go too high, they simply have other things to worry about. The big paper in the nearby city (in this case, the Washington Post), ignores the small towns, and what local papers there are don't really do much of what you'd call investigative journalism, mainly because there's not a lot to investigate. In addition, most people don't pay a lot of attention to the local papers. In short, Johnny-come-lately's rarely win or hold seats on town councils. Every 5 or 7 years there's a "throw the bums out" movement in Vienna that runs a few candidates. Over the decades I've seen a few of these groups, and they're all the same; someone get's all bent out of shape over one issue and gets some like-minded friends to go in with him. They raise a big fuss and end up with maybe 30% of the vote. You also never see them again. So bright and early Tuesday May 2 I got up bright and early to help mom get re-elected. 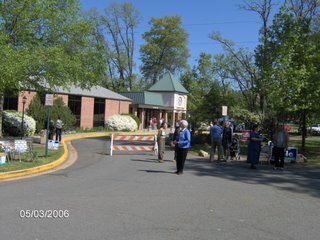 First I stopped off at my voting place in Leesburg VA to vote, more about which later. I was at my voting place at 6:05 AM, and was the 6th person to vote. Then it was off to Vienna. My job was to give mom's handout to people coming to the polls. Helping one or another parent get elected or re-elected is a family tradition which goes back over 20 years, and more about that later too. Here we are, in order from left to right; my sister, Mayor Mom, and myself. My father was on Vienna Town Council from 1982 until his death in 1996. Mom was appointed to fill his seat, and she won re-election twice after that. In 2000 the mayor, Charlie Robinson died, and the town council appointed mom to fill his seat. The next year she won re-election, as she has done every time since then. For over twenty years it at all possible everyone in the family has helped out election day. 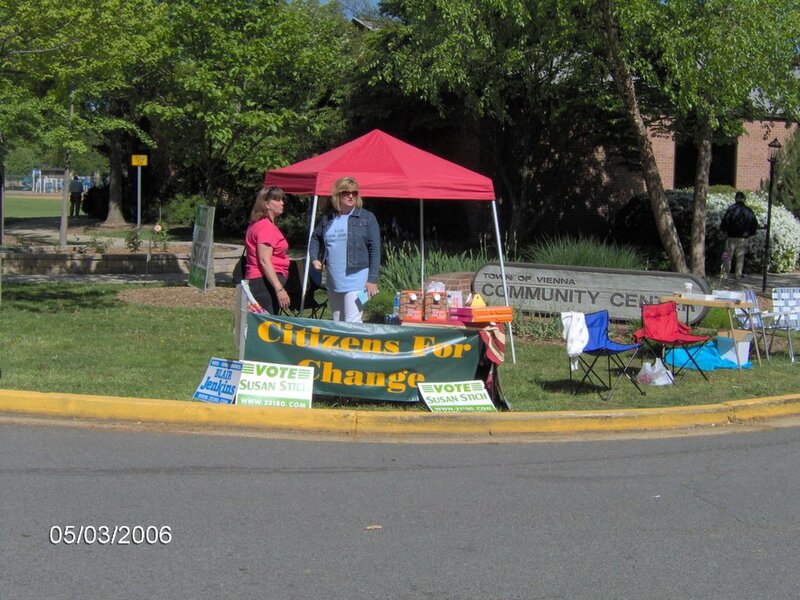 We stand outside the polls and hand literature to voters. I've worked at many elections, not only Vienna town elections but national ones too. Usually, on election day, the candidates and their workers put everything aside and act like old friends. Which, as you might imagine, in small towns they usually are. In this election one of the council members, George Lovelace, was challenging my mom. George has been on and off town council for I imagine close to 20 years. Despite the sometimes rivalry, I consider him a family friend. His children were there helping him election day, and a casual observer would never guess that we were running against each other. It's the same with the council seats. Everything is usually very cordial and friendly among incumbent and challenger alike. Most of the time the challengers are people who are well-known around the community and have served on numerous town boards and commissions. They and the incumbents know each other. 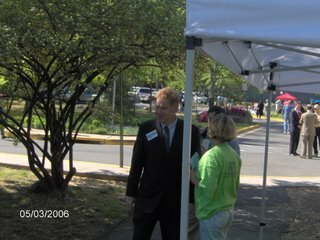 Rep Tom Davis, US Congress (R-Va), showed up to shake some hands. A total fo 2304 votes were cast, which is about 10% of eligible voters, pretty typical for a small town. Kelleher, Cole, and Polychrones were the incumbents on town council.